The Secret to Mega Blossoming Plants is… Salt? Wait, What? Ah yes, that miracle in a bag that is probably collecting dust somewhere in the back of your pantry. Many people know at least a few of the billion uses of Epsom Salt; whether its for radiant skin in the form of lotion, to alleviate constipation, or the way it can help to relieve muscle pain when added to warm bath water, but not as many people are aware that using this miracle compound when gardening can make a huge difference in the size, color, and vitality of flowering plants, fruiting plants, house plants, and edible plants. Yes and no, but when it comes to Epsom salt, it is important to mention something- it isn’t salt. So what is Epsom Salt? Epsom Salt is actually Magnesium Sulfate. It gets its (somewhat deceptive) name from it’s place of origin. This salt is actually from a saline spring in Epsom, Surrey, England. It has some other names, such as epsomite, or kieserite; but no matter what you call it- this magnesium sulfate crystal has been used in agriculture for decades as a fertilizer. How does Epsom Salt Work as a Fertilizer? Magnesium is an essential element in the chlorophyll molecule, and sulfur is an important micronutrient for plants. Epsom salt, due to its composition and high magnesium content, works as a fertilizer because it fixes both magnesium and sulfur deficiencies in soil. What makes Epsom salt a superior fertilizer is two fold. It is nearly neutral in acidity, so using Epsom salt feeds the plants without making a noticeable impact on the pH of the soil. How does Epsom Salt Benefit Plants? What plants benefit the most from Epsom Salt? Although it is a great soil additive in the majority of plants, there are some specific plants which gain the most benefit from its use. These plants are plants that are generally categorized as magnesium hungry plants, like roses, potatoes, lemon, carrots, peppers and a few others. How do I use it with My Plants? How is this for simple? Fill your watering can and add 1 teaspoon of Epsom salt for every liter of water. This method is the general guideline, but some plants use a little more, or a little less. You will want to up the concentration to 2 teaspoons of Epsom Salt per every liter of water. Apply this solution to the roots section only, and only apply every 15 days or so. Roses need a lot of magnesium. Epsom salt is a miracle worker for flowering plants. Simply put a teaspoon of this salt around the base of the plant near the roots during transplanting, and then again during flowering. This will encourage the growth of basal canes, or those thick stems that produce the most support and foliage for plants. There are a ton of uses for Epsom Salt, and one of the most handy is as a fertilizer for your home garden. 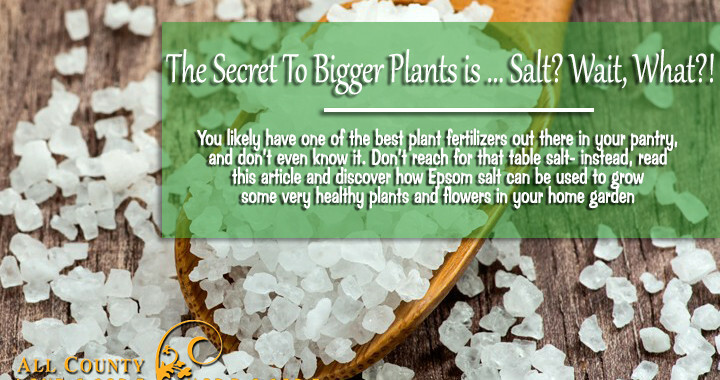 Epsom salt creates super sized blossoms, lush foliage, and strong healthy plants. It is safe for indoor and outdoor use, and most people have some in their house already! Don’t have any ? You can pick it up basically anywhere groceries are sold, or at most local pharmacies!